Rococo Skin Lightening Cream seems to be a promising product at first due to the fact that the manufacturer ensures that the user knows exactly when the product should be used and how to apply it. Today we will discuss a product called Rococo Skin Lightening Cream. The manufacturer claims that this product can help give you fair skin, reduce pigmentation, and also remove brown spots on the skin. 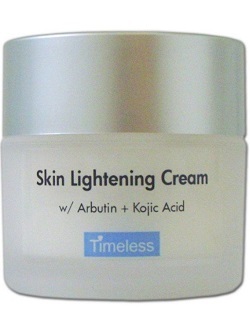 Ultimately, it has the ability to lighten the skin due to the presence of bleaching properties in the product. Not only does this product work on the face, it also helps to lighten dark areas under the arms and the lips. To see if Rococo Skin Lightening Cream can offer you these benefits and more, read our review below. 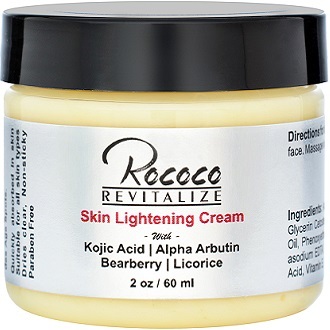 The key ingredients in Rococo Skin Lightening Cream seem to be Kojic Acid, Alpha Arbutin, Bearberry, and Licorice. The manufacturer claims that these ingredients provide skin lightening, antioxidant, and anti-bacterial properties. Also, the Bearberry and Licorice help to keep the skin moisturized and looking younger. As mentioned before, we assume these are the key ingredients in the product. It is always best to know what the key ingredients are as well as information such as patented ingredients, clinically proven ingredients, and if the product is vegan friendly. Many other brands indicate these aspects. It is quite disappointing that this product does not. The user is suggested to apply a thin layer two times a day, only after washing the face. It is best to message the cream in circular upward motions on the entire face and neck. Unfortunately, the product does not come in an airtight pump bottle which is much easier and more convenient than a jar. A 2 ounce jar of the cream can be purchased online from the official website for a total of $24.90. For a 1 ounce jar it costs $12.90. There are however no discount offers or cost effective bundle deals to choose from depending on your need and finances. We are rather concerned about the guarantee offered by the manufacturer. They state that most new and unopened products may be returned for a refund, within 30-days. There is no indication as to which products are eligible for a return and which are not. In addition to this, you may not return a used item. Nonetheless, 30-days is much too short time to know if the product works or not. This is a weak money-back guarantee and may leave you at risk. Rococo Skin Lightening Cream seems to be a promising product at first due to the fact that the manufacturer ensures that the user knows exactly when the product should be used and how to apply it. However, we came across a few things that left us doubtful. First of all, there is a lot of missing information concerning what the key ingredients are, if any ingredients are patented, and if they are clinically proven to be effective. Furthermore, it does not seem as if the manufacturer wants to take care of their clients in terms of discounts or guarantee. Due to these reasons, we do not recommend the use of Rococo Skin Lightening Cream.